Evidence is something that contributes to knowledge of what happened. Proof is evidence that is sufficient to demonstrate the certainty (or truth) of something. Evidence is something that may lead to proof. It may not. You lose control of a car driving down an icy street, the car slams into a tree, crushing the frame, only the passenger door is operable. You are trapped. You are suddenly seized by a tremendous pain in your chest that radiates down the left arm. Still conscious, you recognize that there are just a few minutes to get aid to prevent death. You are relieved as you see two people approaching, the first to get to the car is a man waving a Bible who gets in the passenger seat and urges you to pray with him, citing chapter and verse, Matthew 21:22, "If you believe, you will receive whatever you ask for in prayer.” You begin to pray. The second person arrives, a women carrying a portable defibrillator. Do you demand that the bible-waver get out of the car and make room for the women? I argue that the person you turn to for aid reveals your knowledge, faith, and trust. Interesting post. I agreed with the paragraph saying "it is a mistake to reserve “proof” for only indefeasibly certain matters." As it turns out, I am currently in the process of writing a booklet titled "Does science prove God exists?" In the introduction I note that we have two types of courts in the US. One is the criminal court system and one is the civil court system. The instructions to the jury in each court are quite different. A higher level of proof is required to convict a man of a crime than to decide between to litigants in a civil case. In a criminal court it is "proof beyond a reasonable doubt" and in a civil court it is "preponderance of evidence" or "greater weight of evidence." It makes perfect sense to me to use preponderance of evidence as the standard when deciding on the existence of God. By the way, it was the science evidence that convinced atheist philosopher Anthony Flew that God existed. Interesting story. If I was the man having the heart attack, I would trust the man with the Bible to get out of the way since the answer to his and my prayer had arrived. Using the search engine at www.infidels.org for Antony Flew gives us a good idea of what Flew’s conversation actually is all about. I am afraid that due to your Christian apologists, you have missed characterized the Flew argument. If you are on trial for murder and a conviction is a death sentence, do you want a "preponderance of evidence”? Dr. McCormick has characterized the sliding scale fallacy. If God is the ultimate concern or the infinite reality and through is divine providence is the creator and savior, I want proof beyond reasonable doubt. I have actually read Anthony Flew's new book "There is a God." I know the evidence he is looking at and the preponderance of evidence is on the side of God's existence. I don't think this is well understood yet and that is why I am writing the booklet. You are correct that Flew did not become a Christian. At the time he and Roy Varghese wrote the book, Flew was a deist. However, Flew did speak very highly of Christianity in the book. I don't have the book in front of me or I would quote a few sentences. I would like to think Flew became a Christian prior to his death but I don't have any evidence of that. But Flew's book is quite good. He talks about what he used to believe and why he changed his mind. To answer your question, if I was up for murder I would certainly want the higher standard of proof without reasonable doubt. Regarding the existence of God - If you understand probability theory as Pascal did - then you would certainly want preponderance of evidence. As I understand it, Matt is also arguing for preponderance of evidence or something roughly equivalent. Let o be a statement to﻿ the effect the cosmos is ordered in a certain way. The conclusion, g, asserts the existence of a creator-god. pr(g|o) > pr(!g|o). The fact that pr(o|g) is high does not necessarily mean that pr(g|o) is high. There is no reason to believe(inverse probability) pr(g) > pr(!g) in fact it would be the other way around. So a priori, it is much more likely that there is no creator. No. Pascal would not accept that argument, especially not in today's world. Pascal was not approving of the deductive arguments for God but he was very supportive of evidences for God. And the number and quality of evidence for God from science is much, much greater than in Pascal's day. I'm never quite sure what the point of the name dropping of famous theists, or famous atheists who converted is supposed to accomplish. Is the argument supposed to be something like, "1. If X famous atheist converted, then so should McCormick. 2. Flew converted. 3. therefore, so should McCormick?" It's always possible to find outliers on the curve, of course. Famous Harvard psychiatrist John Mack was convinced that alien abductions of humans were real. Linus Pauling became convinced that mega doses of vitamin C could cure all sorts of ailments. Isaac Newton advocated astrology and alchemy. But in general, education and intelligence are inversely correlated with religiousness. That is, as intelligence and education go up, religiousness drops off. What matters in science and academics is when an informed, broad based consensus develops in a relevant field of experts. Recent polling of professional philosophers shows the wide majority of them as atheists. The vast majority of the world's best scientists are atheists. So what is the believer supposed to make of this puzzling part of the theist's apologetic playbook? Ron Cram - " since the answer to his and my prayer had arrived." Not quite, per the scenario, the women with the AED was already there. You would have to propose that God "answers" prayers that haven't been prayed yet. "But in general, education and intelligence are inversely correlated with religiousness. That is, as intelligence and education go up, religiousness drops off. What matters in science and academics is when an informed, broad based consensus develops in a relevant field of experts. Recent polling of professional philosophers shows the wide majority of them as atheists. The vast majority of the world's best scientists are atheists. So what is the believer supposed to make of this puzzling part of the theist's apologetic playbook?" But you're talking about people in our modern western world. The prevailing modern western metaphysic shapes our beliefs about the world. Moreover it matters not at all that the wide majority of professional philosophers are atheists, reject a belife in a "life after death", etc. What matters is the arguments they advance to support their positions. And in my experience their arguments almost inevitably attack the weakest concepts of a "god". It is not therefore surprising that they are atheists! "Furthermore, the description needs to it needs to be sufficiently superlative to warrant the "God" label," and, one would hope, it would have some semblance to the supernatural being that billions of traditional believers have advocated for centuries". I'm sure you would like that. It's very easy to attack the beliefs of people who have never entertained a philosophical thought in their lives. Somewhat more difficult to attack sophisticated concepts of "God", but which might still be reasonably labelled "God", as advocated by intellectuals. "A brief note about proof: Many people who haven’t reflected on the topic much have the sense that we should reserve the term “proof” only for those cases where we have the most substantial level of deductive certainty". Well that's simply what the word "proof" means. So it makes no difference how much we have reflected on the topic (and I have done so a lot). "And many of the same people who feel this way about proof have the same impulse about “knowledge.” We only know those things, they say, that we can prove. No other less certain matters should be called knowledge". Indeed many people do. However I don't. "For a number of reasons, I think it is a mistake to reserve “proof” for only indefeasibly certain matters. First, if we raise the bar on “proof” this high, then there remains little or nothing that we know". Here you conflate proof and knowledge. Just because we cannot prove something doesn't mean to say we lack knowledge. "'m never quite sure what the point of the name dropping of famous theists, or famous atheists who converted is supposed to accomplish. Is the argument supposed to be something like, "1. If X famous atheist converted, then so should McCormick. 2. Flew converted. 3. therefore, so should McCormick?" No, that is not the argument. The argument is that Flew knew all of the arguments used here to disprove the existence of God. He fact he helped formulate some of them. But these deductive arguments ultimately failed, just like they always have through history. It took about 20 years for Flew to change his mind, but he made a commitment to follow the evidence wherever it led. Eventually Flew found the evidence from science supporting God's existence more compelling. 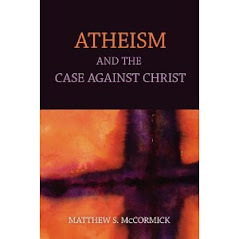 Therefore McCormick should drop his attempts to prove or disprove God from deductive argument and make a commitment to follow the evidence wherever it leads. If nothing else, I have the history of philosophy on my side. Perhaps you missed the part of our discussion here regarding the fact God is not constrained by time. "Famous Harvard psychiatrist John Mack was convinced that alien abductions of humans were real." Sorry. can't comment on this one as I don't know the story. "Linus Pauling became convinced that mega doses of vitamin C could cure all sorts of ailments." This is quite true. Our knowledge of science and medicine is increasing all the time. Pauling was on the right track. Vitamin C is a powerful antioxidant and antioxidants have powerful natural healing abilities. Different organs benefit from different types of antioxidants. The antioxidants in green tea are especially good for the lungs. The antioxidants in coffee are especially good for the colon, etc. There are two keys to living a long life - calorie restriction and a high level of antioxidants in your body. "Isaac Newton advocated astrology and alchemy." This is also true. I've never understood his attraction to astrology but his interest in alchemy is consistent with the level of scientific knowledge in his day. The truth is that lead and gold are made in the same way, inside stars. In Newton's day, they did not understand the process like we do today. Your statements here are not quite correct. The percentage of scientists who believe in God today is roughly the same as 100 years ago. It is true that polling shows the more educated people are, the less likely they are to be religious - but the reason has more to do with our education system than the quality of the evidence. Go to any major university and you are far more likely to find more atheists in the philosophy department than you are in the physics department or the mathematics department. Regarding the apologists playbook, my guess is that the goal is to get people to agree to look at the evidence. Of course, it is not possible to argue anyone into the kingdom of God. Even if the person is willing to follow the evidence where it leads, as Anthony Flew did, that does not mean the person will bow the knee to the Creator. There is always a choice involved in faith. The apologist's goal (at least my goal) is to let people know it is not unreasonable to believe in God. I think you are being hypocritical by stating “my goal is to let people know it is not unreasonable to believe in God”, but then try to convert atheist to your belief system and arguing about the preponderance of evidence. Professor Kirby, who is a secular humanist, thinks theist do have an epistemic right to their beliefs. If we take William James’ ‘Will to Believe”, Richard Taylor on Faith, Wittgenstein’s fideism, Plantinga on reformed epistemology seriously then Christians can not be considered insane. Instead of arguing about how philosophers have failed to prove the negative, you should be writing a justification of knowledge for Feelings (religious experience), Facts (natural theology) and Faith. PS: Students of philosophy engage in epistemic discourse in an analytical approach to the writings, for instance, W.K. Clifford “The Ethics of Belief” versus William James “The Will to Believe”. Apologetics (from the Greek, a defense), which assume the premise “God exists” does not engage in such activity. To reiterate, if you are posting to a philosophers website, you should be more philosophical. There is nothing hypocritical in my stance or actions. My goal is to let people know belief in God is reasonable. In order to convince this, I have two areas of activity. First, I have to show the errors in the deductive arguments against God's existence. Second, I need to explain the positive evidence for God's existence from science. 1)The universe exist only contingently. 2)If anything exists contingently, something must exists necessarily. There is no grounds for saying (3) is an Omni-God or a personal being with moral perfection. This says nothing about just one being. It could be some cosmic force gravity. A flaw in Aquinas thinking is in that he assumes that what exists contingently cannot exist through all time. According to Hume, a cause must precede its effect. It is clearly impossible for anything to cause itself. For to cause itself, it would have to precede itself. 4)Existence is not a predicate (Kant). 5)Existential statements are second order. 6)No existential statements can be logically necessary. I have already conceded that any attempt to prove God through deductive reasoning is doomed to failure. My point is the same applies to any attempt to disprove God by deductive reasoning. However, quoting you “I have to show the errors in the deductive arguments against God's existence.” and “I have already conceded that any attempt to prove God through deductive reasoning is doomed to failure”. Do you or do you not have to show why a deductive argument is a failure? I maintain pseudoscience = df. “trying to explain the positive evidence for God's existence from science”. Let Ta = absolute start of time or df. T = 0. Let Tp = Planck time = 6.4x10E-44 seconds. In contemporary physical science there is no first instance Ta. In other words the universe is half-open in the earlier direction prior toTp. It is illogical to instantiate an archetype supernatural being, i.e. “god of the gaps”, because such an entity would be eternal and therefore a potential infinity (Aristotle) before Tp. If you think that your pseudoscience includes an anthropic principle and God has purposely created a “Goldilocks zone“, Dr. Stenger and Dr. Krause have knocked that idea out of the ball park. Well, I see you are at least familiar with some of the arguments regarding the Big Bang. This is a start. Regarding the start of time, it is true that physicists and mathematicians can model the early universe mathematically going back in time to just after the Big Bang. They can model to t > 0 (about one trillionth of a second after the Big Bang), but they cannot model t = 0. The reason is the math breaks down due to infinities. But this does not mean that t = 0 (the start of time) did not happen. Logic and the laws of physics can take us back further than mathematics alone. When we say we can only model to t > 0, someone may think t > 0 means a singularity that could remain static for an indefinite period. But the laws of physics say if something exists that is immensely hot and dense, it would immediately begin to expand and cool. If someone, for atheological reasons for example, wanted to say that t = 0 never existed, he would have to exchange the miracle of creation for two miracles which are even more improbable. Instead of God creating the universe from nothing, you would have to say that a stable, non-expanding singularity existed in eternity past (the first miracle) and that for no reason at all suddenly lost its ability to remain hot and dense and began to expand and cool without any cause (the second miracle). As you can probably tell, I don't have enough faith to believe the second scenario. Logic demands the t = 0 happened. The Goldilocks Zone is only one small part of the fine-tuned universe argument from science. Stenger has written a book with lots of arm waving on the fine-tuned universe, but he only deals with a few of the observations of the fine-tuned universe and there are hundreds of them. More importantly, they are interconnected. This is a point Stenger evidently missed or did not understand. His argument is mainly about the isotopes of carbon. He suggests if one parameter was changed to reduce the amount of carbon in the universe that you could change another parameter and get the carbon back. The problem is that changes other parameters causes other problems. A full refutation of Stenger will be forthcoming. I have stated that I am a student of Philosophy with enough units for a minor. I am a retired EE(electrical engineer) with a masters degree. I would like to know what qualifications you have, so you can be taken seriously, in challenging the likes of Dr. McCormick, Dr. Stenger, Dr. Krause, Dr. Drange, Dr. Rowe, Dr. Martin, et al? You just proved that you are a pseudosciencist. A real sciencist does try to explain the unknown by instantiating an archetype supernatural being that peforms miracles. David Hume’s (1711-1776) Section X in his essay An Enquiry Concerning Human Understanding regarding claims that miracles can never be justified. Hume’s definition of a miracle is “a violation of the laws of nature”. Swinburne agrees with Hume and states a miracle is “a transgression of a law of nature by a particular volition of the Deity or by the interposition of some invisible agent”. 1. Laws of nature are a posteriori considerations. 2. Our experiences are very strong in support of natural laws. 3. A miracle is a violation of nature. 4. By definition, this is a breach of highly probable rules of the universe. 5. Therefore, it is not justifiable to believe that a miracle has occurred. The FIRST problem is you have not established that a Deity or some invisible agent is a metaphysical reality. 1) If there is a God, For an infinite time Tp₋ₓ God does not have the will to create, because God is perfection, and would not have needs or wants. 2) If there is a God, At some point in the infinite past of nothingness, God has the will to create (Why)? 3) If there is a God, Given E=mc², how can God bring about energy or matter out of nothing? You understand that Georges Lemaitre a Belgian priest is responsible for proposing the Big Bang. The Pope heralded it as proof of Genesis, and then had to retract because it was science not theological. A real sciencist does NOT try to explain the unknown by instantiating an archetype supernatural being that peforms miracles. thought experiments are our thoughts now about a possibility at another time. The woman with the AED is only potential aid (at the moment your heart is still beating, you're conscious)and not a guarantee of continued life. Her potential outside or inside the car with life resuscitation is equally effective. As you revealed in your answer, you mentally adjust the probability of survival to human, not divine, direct aid. The prayer is answered, bible-waver depart, let's get on with some real solutions! Your trust in humans outweighs your trust in the divine. After the accident, should you live, the rationale that God answered your prayer would be typical thinking for the Christian. If the AED was never used for your survival the thought that it was divinely planned would, I propose, drop from the "God saved me" narrative altogether. You have misinterpreted your own scenario (example), and therefore missed the truth of the example. No since, you wouldn’t have to ask me to move, since I would willingly get out of the way, because I would have recognized the “women carrying a portable defibrillator” has the answer to the injured person’s prayer, just as I did here. And so it did, and you were given a demonstration of that right here. How that for a dumb Christian? So, can we conclude that we just don’t know, that no one knows and anyone claiming to have this knowledge is lying?